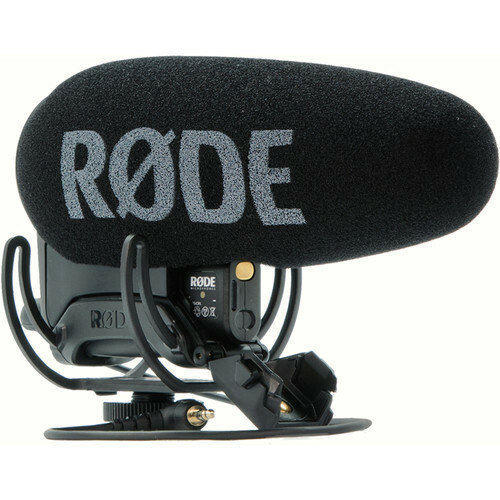 The Rode VideoMic Pro Plus is a supercardioid condenser shotgun microphone with an integrated Rycote Lyre shockmount, a built-in rechargeable battery, an improved response over its predecessor (20 Hz to 20 kHz), and improved RF-immunity as well. The microphone can be used to capture audio for camcorders, DSLR, and portable recorders as a source of primary and reference audio. The VideoMic Pro Plus sports a 3.5mm stereo mini-jack termination, outputs a dual-mono signal, and provides a TRS cable to make the connection. A micro-USB cable is also supplied, which can be used to draw bus-power. The microphone&apos;s supercardioid polar pattern ensures that surrounding audio is minimized, and that your recording is focused on the subject in front of the camera. Its inherent low-noise circuitry ensures you will not pick up any sound from the microphone&apos;s robust innards. The microphone boasts +20 dB settings for DSLR cameras, a flat setting for high-quality preamps, and a -10 dB pad. Other features abound, such as an Automatic Power Function, a built-in battery door, and a high-pass filter with cuts at 75 Hz and 150 Hz. The filter will prevent low-end noise such as air conditioners and traffic from being picked up on the resulting track. If you&apos;re unsure how loud the audio you&apos;re capturing might be, you can set the right channel to record at a lower level for safety. A selectable high-frequency boost is also available. To power the VideoMic Pro Plus, you can use two AA batteries, the micro-USB cable, or the included rechargeable LB-1 lithium-ion battery, which lasts 100 hours on a single charge. This microphone features an auto-powering feature which helps you save battery life by powering on with a mic cable is connected and powering off when it isn&apos;t.
Box Dimensions (LxWxH) 8.5 x 5.1 x 3.1"